An 8kg washing machine is large enough for a family-of-four, and not too big to sky rocket your electricity bill. There's easily enough space to fit a big duvet and get a lot of laundry done in one go. We've analysed over 200 washing machines on the UK market and chosen our best 5 for you. We do have a bias for tried-and-tested brands, but at the same time don't believe in paying over-the-odds for them! Here's our list of the best 8KG washers available in 2019. 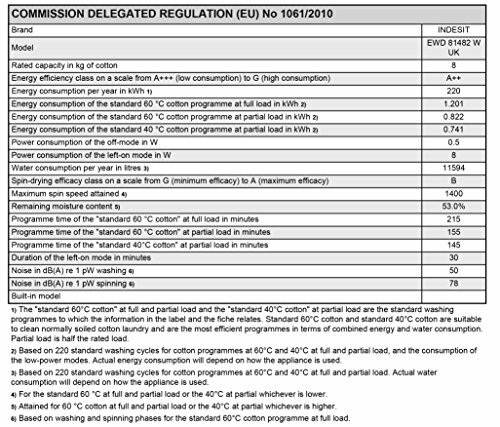 Washing machines are rated based on how energy-efficient they are. The highest grade is A+++, and the lower end of the scale in 2019 tends to be A+. You can expect A+++ models to make good use of water and electricity, but they often cost more, too. We have also reviewed the best energy-saving washers here. Washing machine manufacturer's don't tend to advertise these ratings - but they should. The more water left in the drum after the cycle completes, the more time (and energy!) you have to spend drying your clothes. You can expect the best washers in 2019 to leave around 50% or less. An average model will leave around 55%. Spin speed does get a lot of advertising print, but it pays to be objective in this area. The models on the market today range in speed from 1600 rpm to around 1100 rpm. Generally, you can make the argument that a faster spin speed is better. All things being equal it will lead to a quicker, higher-quality laundry performance. However, there are some caveats to this. The first is that many machines don't reach top speed for very long. Only certain cycles (like cottons) can run at full-speed. A faster spin speed also creates more noise - and you can expect to pay more for them. That's why models that offer variable spin speed are a real bonus and you should look out for them. Everybody knows that quiet washing machines are much better than ones that sound like a jumbo jet in the kitchen! Still, you do need to be careful comparing washing machines. They are rated in decibels (db) and the general range is between 70db - 80db at high spin. However, 80db is in fact double the noise of 70 db. ​When making our lists and reviews, we always give extra marks for the quietest models. You'll find a lot of difference between the type and amount of programs that various brands offer. Expect to see things like intelligent load balancing (which adjust the water and total cycle time), sports programs, anti-allergy programs and spcial programs for babies and toddler from the more expensive models. Another feature where different models vary is with "Quick Wash". The best machines usually have a reduced-load program (typically half the total capacity) where it finishes in just 15-minutes. Some models take 20 or 30 minutes, and some cheap washing machines don't have this feature at all! ​One final feature where models vary is the delay timer. ​Really you should expect your new washing machine to have a 24-hour timer. This just makes it a lot quicker and easier to set. You will find quite a few models with less than 24-hours though. With a reputation for innovative, quality products, Zanussi can be replied upon to deliver the goods. ​​This 8kg model has the highest energy rating possible - A+++. ​It uses 190kw/h per year and costs approximately £30 to run - which is pretty good for this size. And at just under 10,000 litres a year, water usage is also very decent too. The ZWF81240W has a 1200 rpm spin speed, which might put some off. What it lacks in spinning, it certainly makes up for in programmes. You get a good array including a jeans wash, sports wash and an easy iron function. This model also uses Zanussi's "Aquafall" technology, which showers your clothes as opposed to soaking them. This helps save water. Sadly, there are one or two drawbacks to report about this machine. There is a "Quick wash" - but it's pretty lengthy at 30 minutes. There isn't a 24-hour delay timer. Instead you get a choice of either 3, 6, or 9 hours. And lastly, the guarantee is a bit miserly at just 1 year. Still, this is a ​cheap 8KG washing machine ​which is available at a competitive price. For it's energy-efficiency and choice of programmes it shouldn't be overlooked. 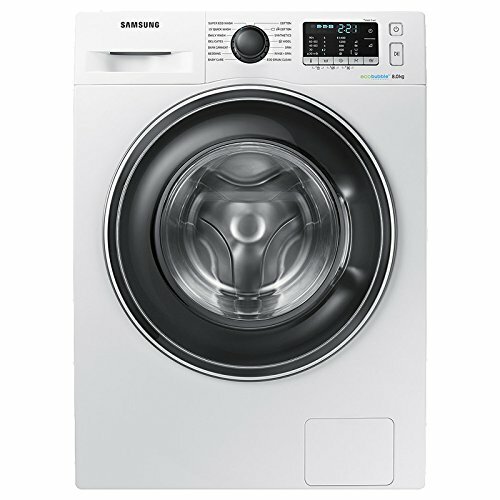 While some may be wary of their mobile phones, Samsung's washing machines have been getting a lot of praise in the UK lately. ​​This 8kg model is from their "EcoBubble" range and like many on this list is A+++ rated for energy-efficiency. Using 166kw/ h and estimated to cost £25 a year, that puts it in between the Zanussi and Bosch models reviewed above. One area where it beats both of these is water consumption. This model uses just 8,400 litres of water a year! This is largely due to Samsung's "Ecobubble" technology. Water, detergent and air are mixed together as they enter the bottom of the drum. This helps use less water and soak clothes at the same time. This bubble method also helps keep detergent residue to a minimum, and there's also an eco-drum cleaning cycle - which makes cleaning a lot easier. There are 14 different programmes, including a 15-minute quick wash, a mixed-load cycle and variable-spin cycles, too. The only area this one loses points is on the noise front. For a 1400 rpm machine, it is relatively noisy at 79db during high-spin. However, many users love how easy-to-use this particular model this Samsung washer is the generous 5-year warranty. Indesit has a strong reputation for quality, simple to use and no-frills appliances at excellent prices, and this practical and usable washing machine is no exception. We’ll start by pointing out that this one is less than half the price of some on this list, and yet it performs very well. ​This one scores A++ for energy-efficiency. That's not the best - but it still only uses 200 kw/h per year and costs £30 to run. Water usage is also higher at an estimate 11,594 litres a year. ​So you might be wondering just how it got on our list. Well, the price is fantastic and it also has a 1400 rpm. At 78 db, it's reasonably quiet, too. What is surprising (for the price) is there are 16 programmes, including a 20-minute fast wash, a sports programme and also one for babies. In fact, "My Time" is all about convenience, and there are 6 programmes which finish up in under an hour. This makes it perfect for busy families with kids of all ages. This model also uses load balancing technology which automatically adjusts the water and cycle time to the weight of the load. You do only get a 1-year warranty, but you'd probably expect that at this price point. Overall, whilst not the most environmentally-friendly washer, it is certainly the best 8kg washing machine for the money in 2019. Hoover has been a household name in the UK for many decades. Their “Dynamic Next Advance” is a bit of a mouthful, but branding aside there is a lot to like about this 8KG washing machine. For starters, it has the best energy rating - A+++, and its yearly energy usage of 196 kw/h is really impressive for its size. What’s REALLY impressive is that just 44% of water is left after it’s finished. Many washers are closer to 50%, so this will help your clothes dry quicker. This is no doubt down to it’s best-in-class 1600 rpm spin-speed. If there’s one drawback with the higher spin it’s usually the increased noise. And at 79 db during high spin and 61db during regular wash, if you have an open plan kitchen this might not be for you! Still, in addition to its energy efficiency there’s lot to admire about it’s washing performance, too. Hoover’s “ActiveEco” feature means you can wash mixed loads at a temperature of 20 degrees. This saves more energy than a standard 40-degree wash and you don’t need to worry about your t-shirts turning pink. There are also not one but THREE fast washes - 14, 34 and 44 minutes. With 14 washing programmes including wools, delicates, easy iron and an automatic half-load function, you get a lot for your money here. All told, if you’re looking for an energy-efficient 8kg washer which won’t break the bank, this Hoover model is a serious contender. Bosch appliances tend to be priced slightly higher than a lot of the competition - and for good reason. You can usually expect features that cheaper washing machines don’t have and the 8kg Serie 4 is no different. In addition to a 15 minute quick wash you also get a sports program (great for the kids PE kits), a high-temperature anti-allergy wash (great for flu season), a half-load function for the essentials and mixed-loads. The Serie 4 also uses Bosch’s proprietary “Eco Silence” technology - which I must admit to being slightly confused by. During the regular cycle (i.e most of the time) it runs at a very low 54db - quiet enough that you can have a chat and still be heard. However, during fast spin the noise ramps up to 76db. Not the loudest on our list, but you will notice the difference. This is also strange as it has a 1400rpm spin which (all things being equal) tend to be quieter than the 1600 rpm models. The Serie 4 has been awarded the highest score for energy-efficiency - A+++ but I see quite a bit of water is left after the cycle - 54% to be exact. This is quite a bit higher than other machines on our list, such as the Hoover model. Still, this particular model gets a lot of love from users who love the way it looks and on the whole find it easy to use. I think people tend to be reassured by German engineering, and Bosch certainly stand behind their craftsmanship.There is a 10-year manufacturer’s warranty on the Direct Drive motor, and a 2-year general warranty (where others only offer a year). If you need a reliable 8kg machine which can wash different types and sizes of loads quickly, the Serie 4 should be on your shortlist. After researching the best 8kg washing machines available in 2019, we choose the Hoover Dynamic Next Advance as our top pick. 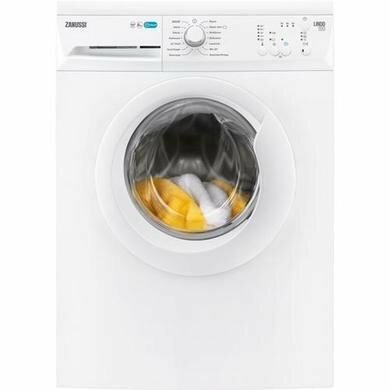 We love how energy-efficient it is, the three different fast wash settings and it can be connected to an app on your smart phone. And best of all - it's available at a sensible price.